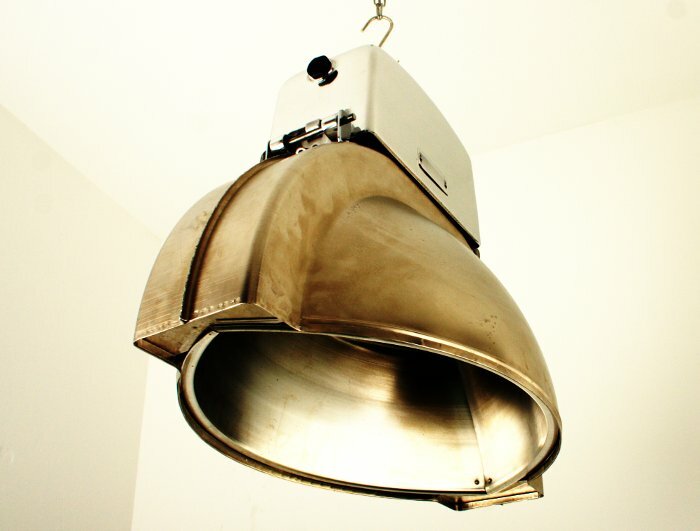 Unusual hanging lamp supposedly used in large kitchens or abattoirs. 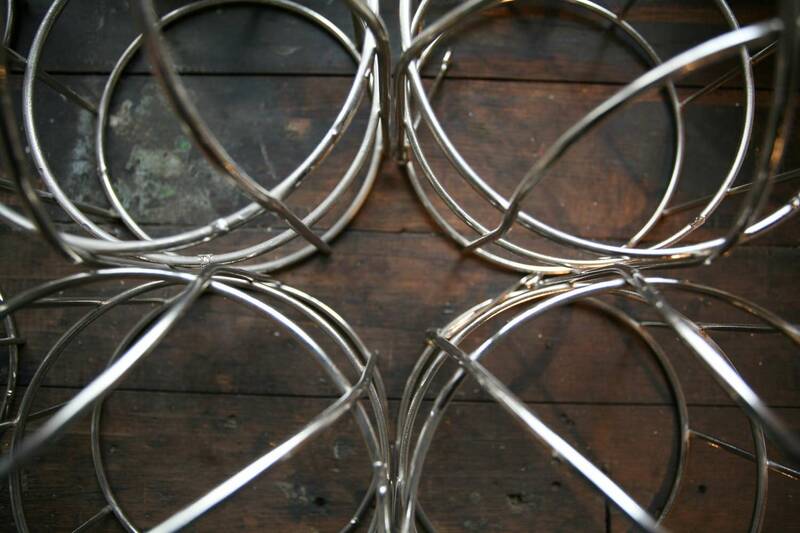 Cable guides and hanging design echo early Hungarian production. 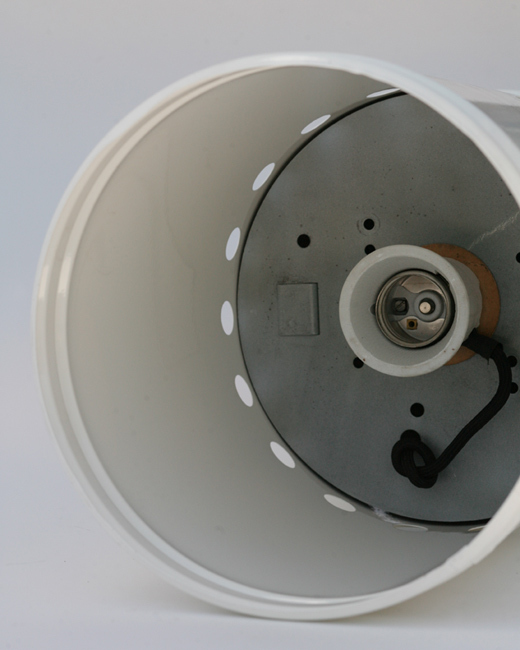 Cast-iron dome with E27 bulb application. Professionally restored to former glory. 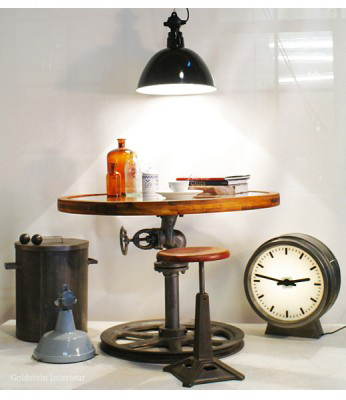 This lamp is available in two diameter sizes (36 cm and 41 cm) and in your own cord color and length! 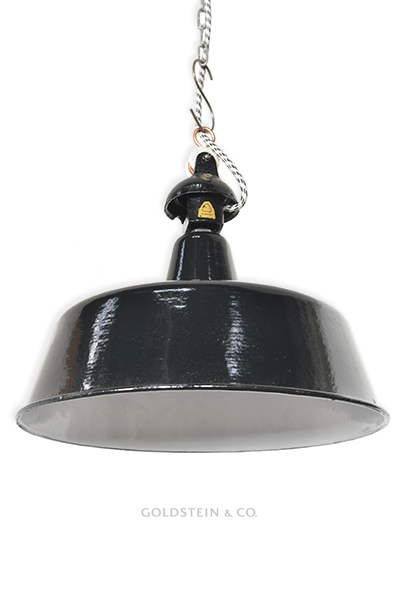 Rare black enamel industrial light with white interior and aluminium cap. 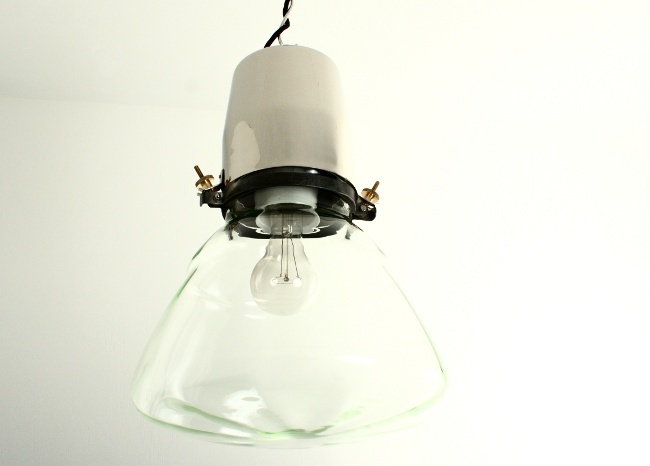 Each shade is rewired and supplied with a ceramic socket for E27 bulbs. 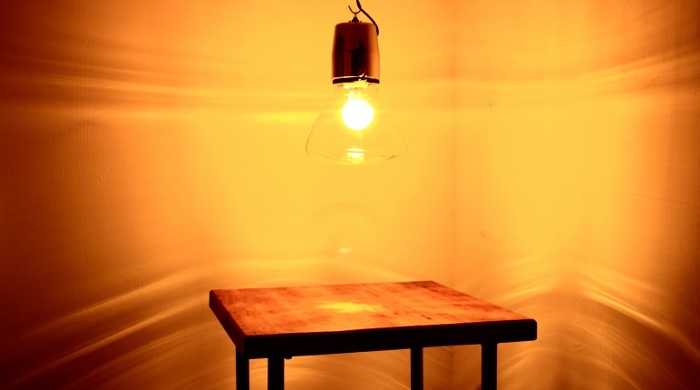 This lamp is available in two diameter sizes (35 cm and 40 cm) and in your own cord color and length! 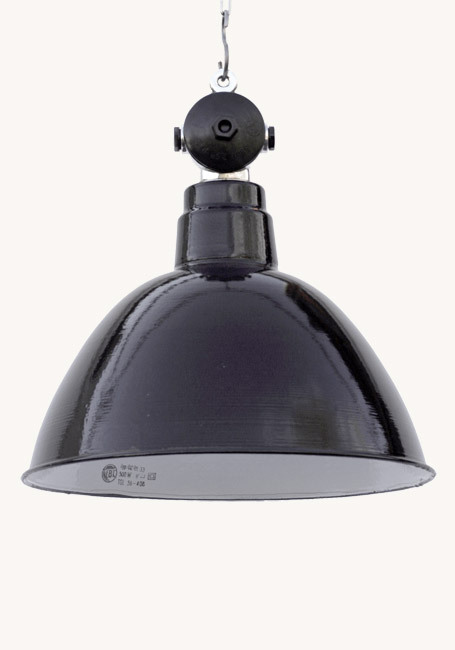 This rare Bakelite light was only produced in the 1950s by light manufacturer Leuchtenbau Leipzig. 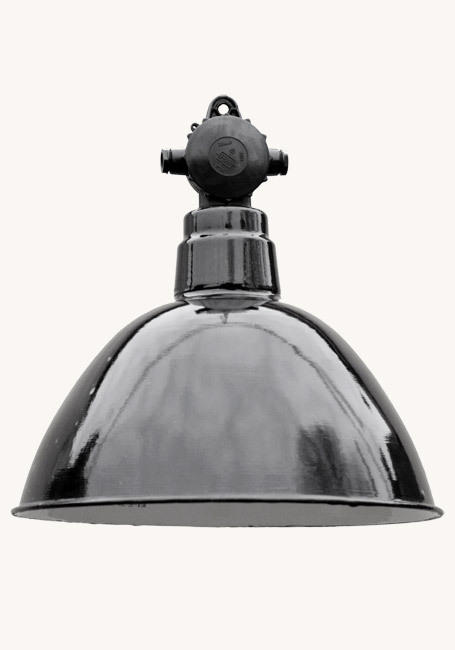 Even the shade was made out of Bakelite, presumably in order to save steel. 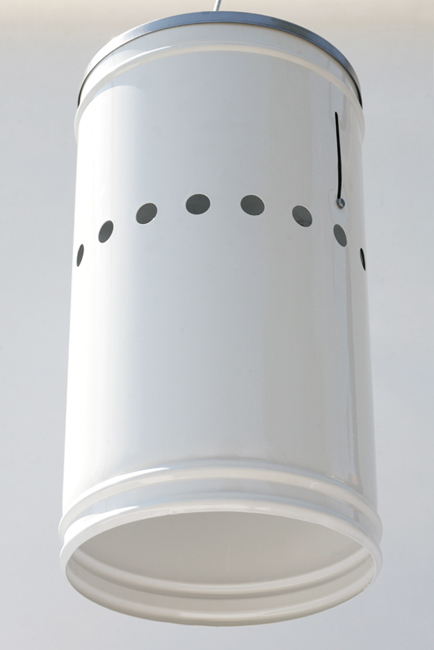 The ceramic fitting features a glass screen. Please note: You can choose your own cord color and length! Availability:Three are in stock. More on request. 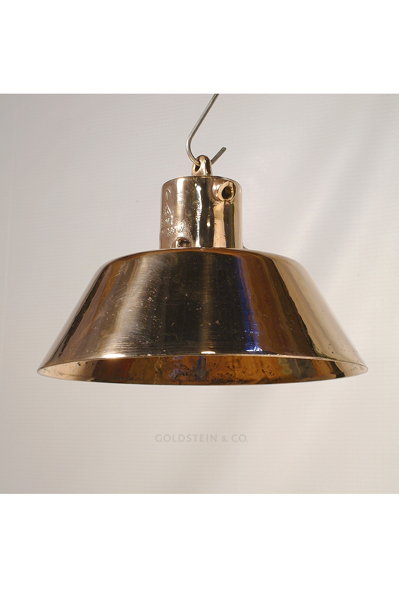 Used as emergency lighting, these lights were suspended from the highest points of factory ceilings, making them very rare and difficult to salvage. 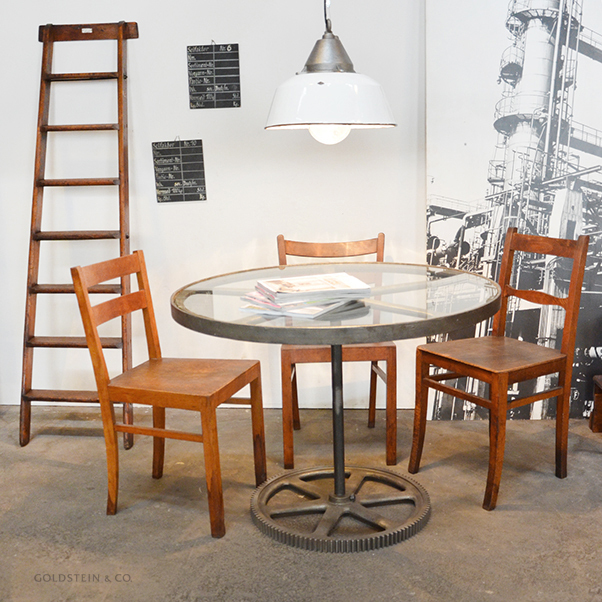 They were built in the 1920s and 1930s to a typically simple design influenced by the Bauhaus. 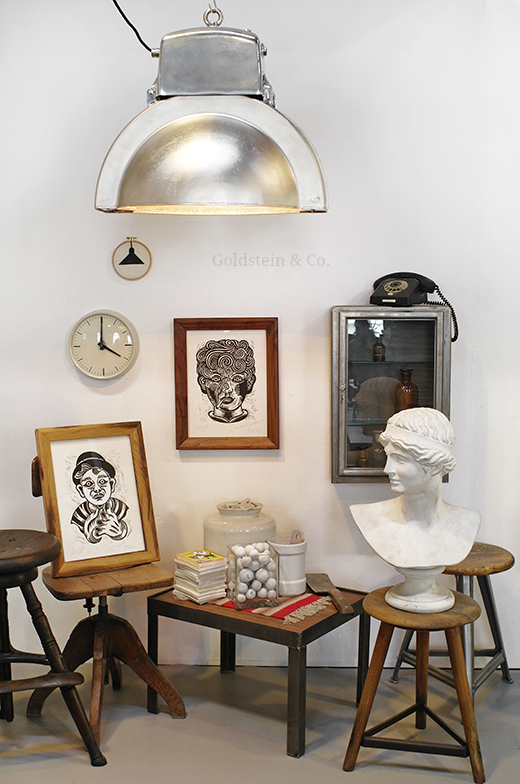 These beautiful lamps have become so rare that we decided they needed a comeback! 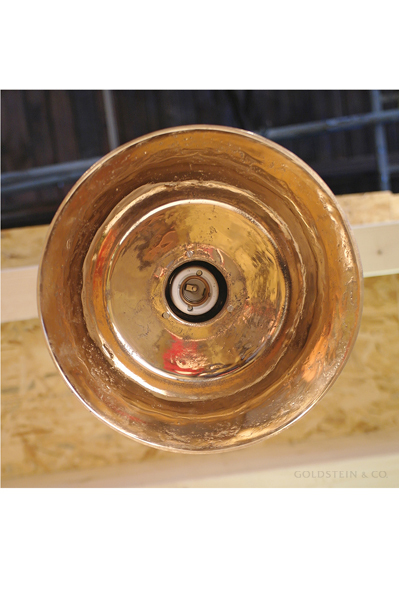 So we discovered a small, family-run foundry nearby which specializes in restorations and reproductions – and they’re now making faithful imitations of these lights out of aluminium and bronze in small batches. 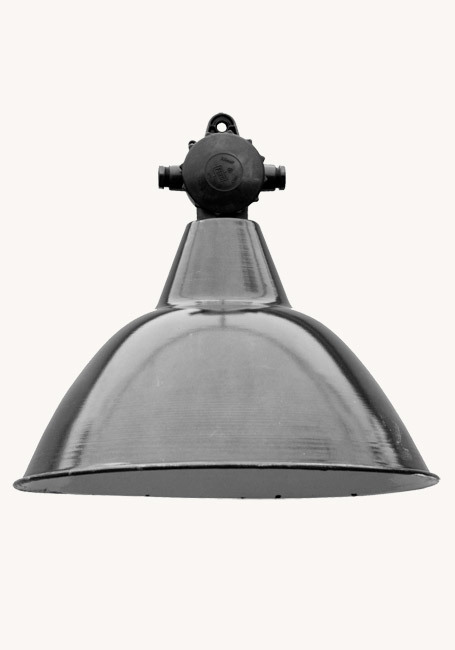 The red brass dome and shade are extremely robust and impact-resistant. 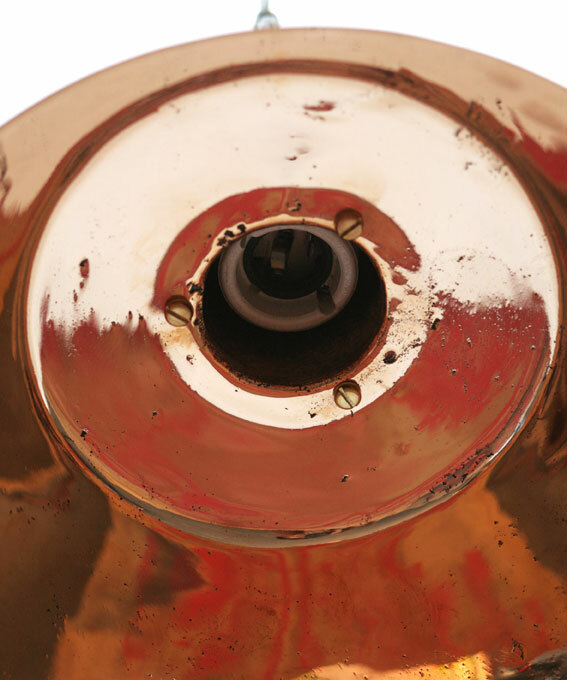 Although re-polished to a high sheen, note that they still contain traces of wear such as scratches and notches. 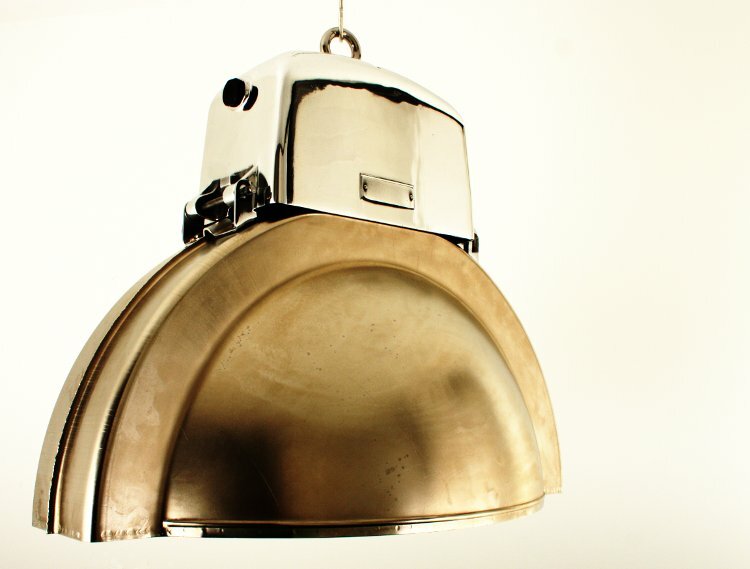 These pendant spotlights come with a ceramic socket for E27 bulbs. 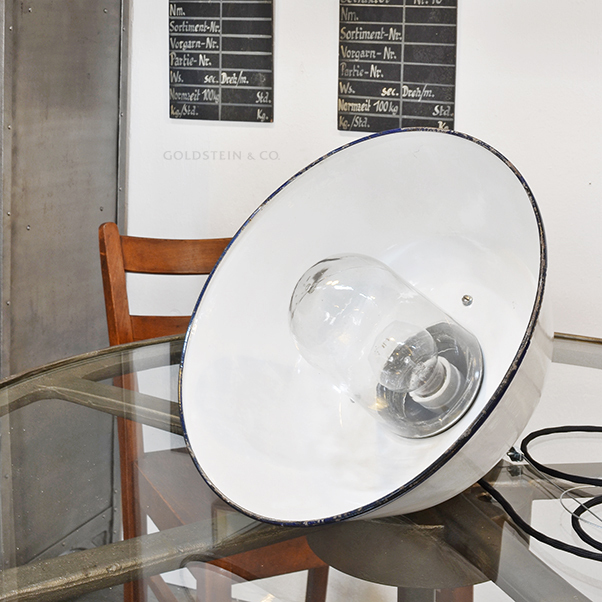 We managed to get hold of another batch of the original glass shades! - Only a few available! 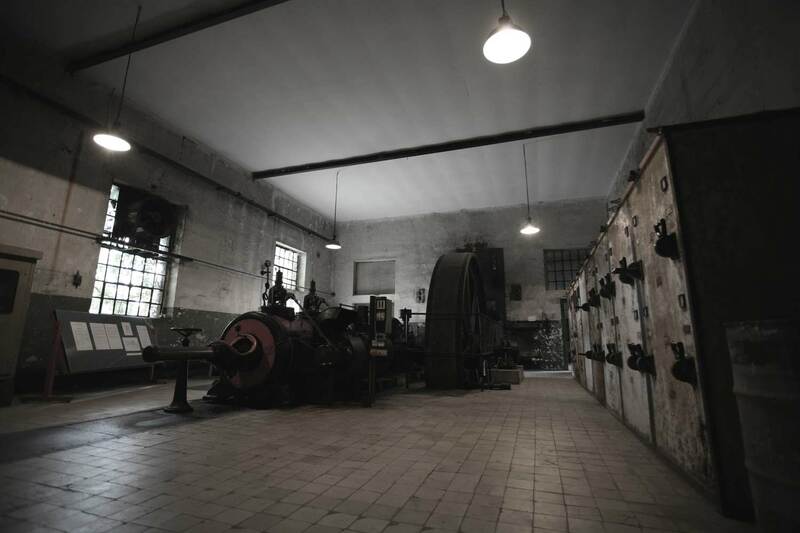 Originally operated as 250–500W vapour discharge lamps, these gems were usually suspended in pairs beneath factory ceilings. 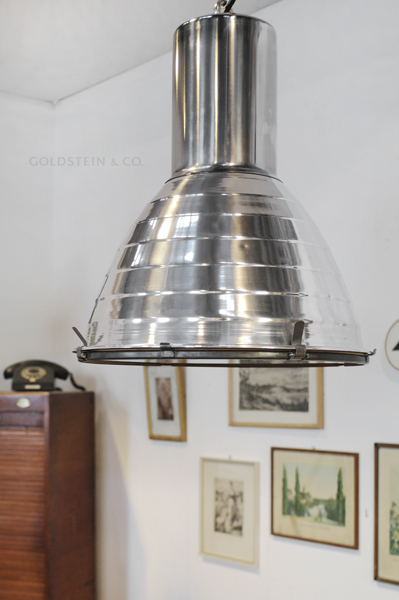 Only a few were produced in the 1950s in East Germany, probably based on designs by the Leipzig firm Kandem, short for Körting & Mathiesen. 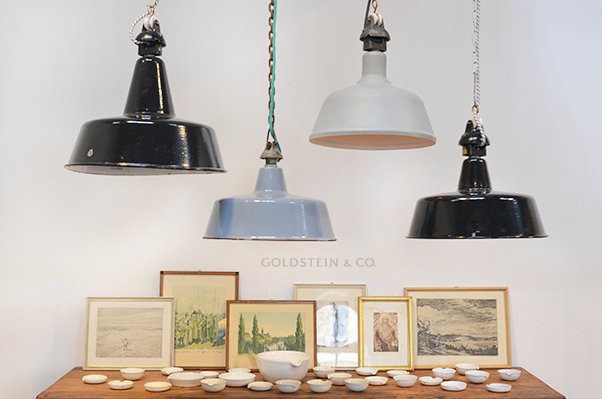 Fitted with a ceramic socket, we’ve converted these lights to work with standard E27 bulbs, nickel-plated the steel upper section and painstakingly cleaned the moulded glass. The structured glass makes for some beautiful lighting effects. 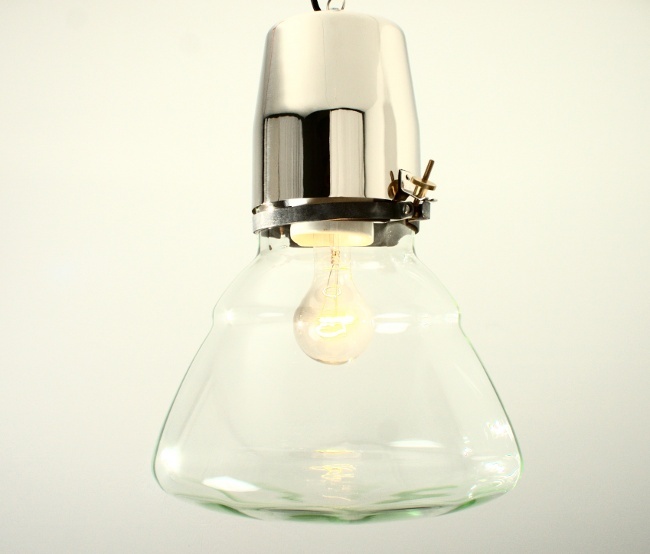 Knurled nuts are used to simply yet elegantly attach the glass shade. 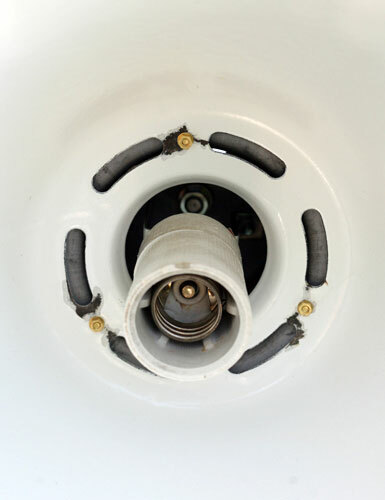 The height of the internal ceramic socket and bulb can be altered with a metal rod to adjust the light cone. 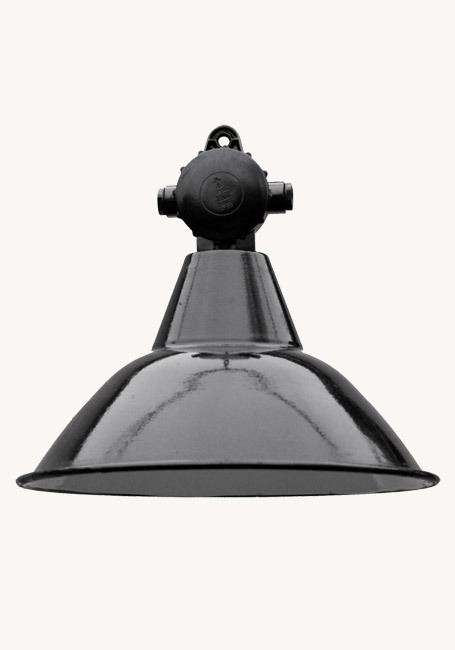 We originally salvaged a large number of LBL spotlights three years ago and they quickly sold out. Although we still had plenty of top sections, we hadn't been able to obtain as many shades – evidently they'd proved popular for target practice among budding marksmen! 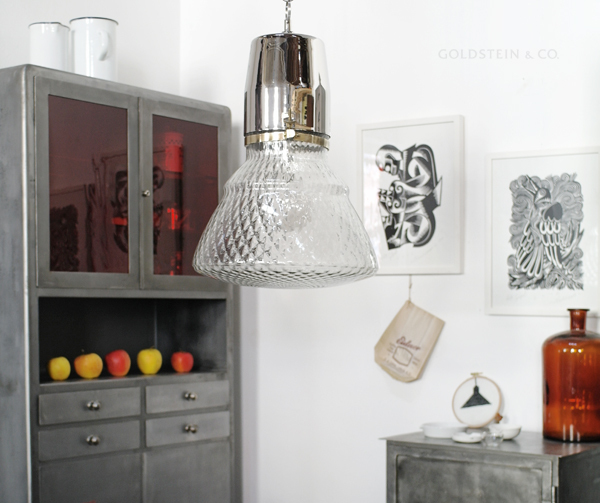 We therefore decided to have hand-blown copies of the shades produced at a small glassworks. 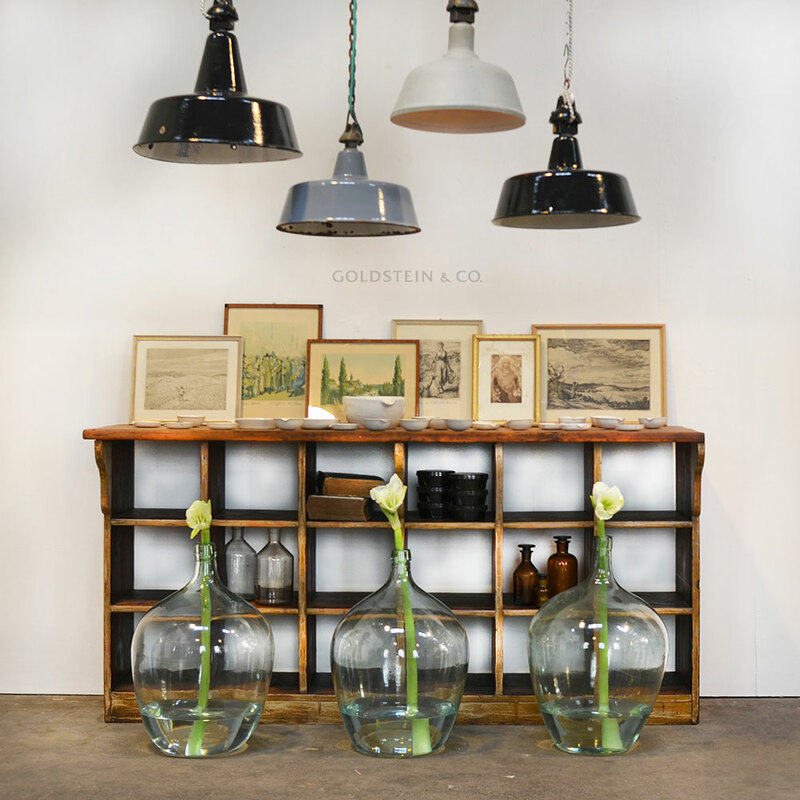 But just as they were about to go on sale, we suddenly managed to get hold of another batch of original glass shades – so it's up to you whether you want to purchase a complete original or a semi-replica! 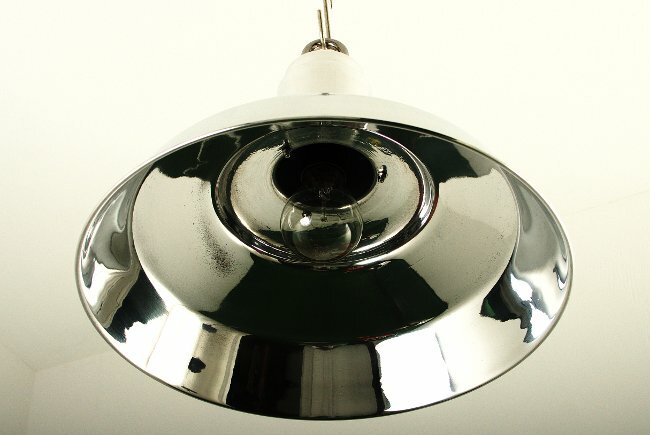 Two years ago, we got hold of a shipment of Russian factory lights made in the 1950s – and they sold like the proverbial hot cakes. Unable to obtain any more Soviet originals, we decided to meet the sustained demand by having our own exact copies produced at a small metal spinning factory in the region. Since they're made out of aluminium, they're extremely light. 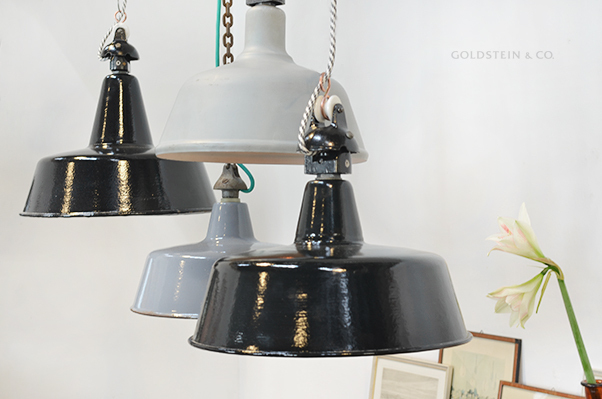 These lights come either polished or powder-coated in a choice of ultramarine, British racing green or light grey. 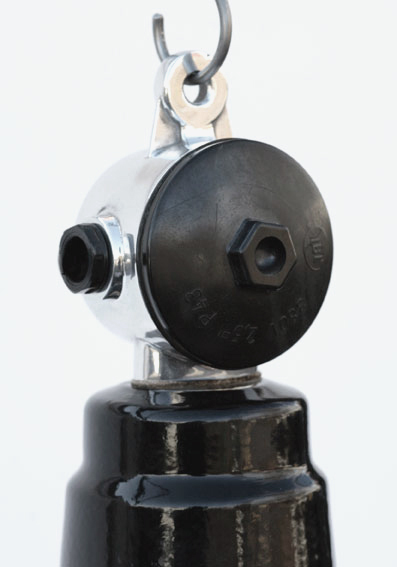 Fitted with a socket for E27 bulbs, they're suspended using a stainless steel lifting-eye nut. Available in bulk. 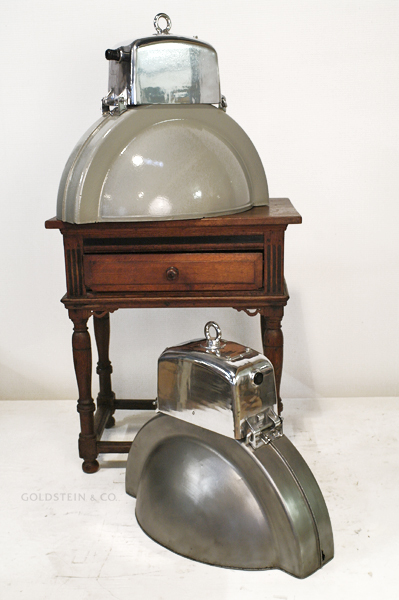 Two different types of this helmet lamp were produced featuring either an enamelled or a painted shade. 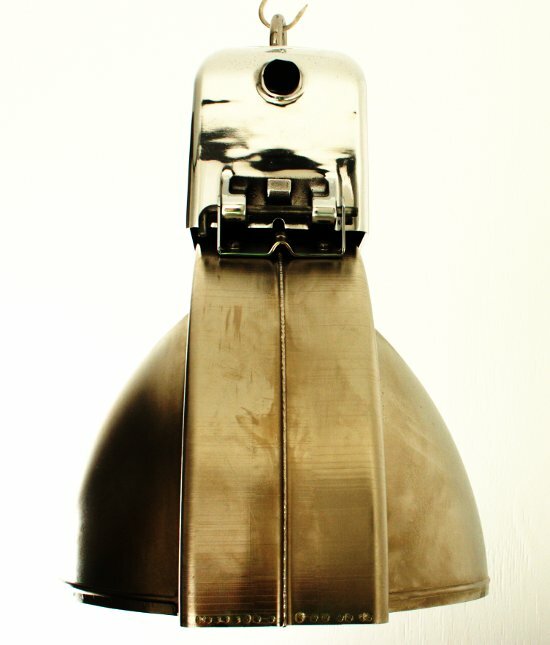 Since the paintwork had been almost completely worn away, we've had some of these lamps sandblasted, brushed and nickel-plated. 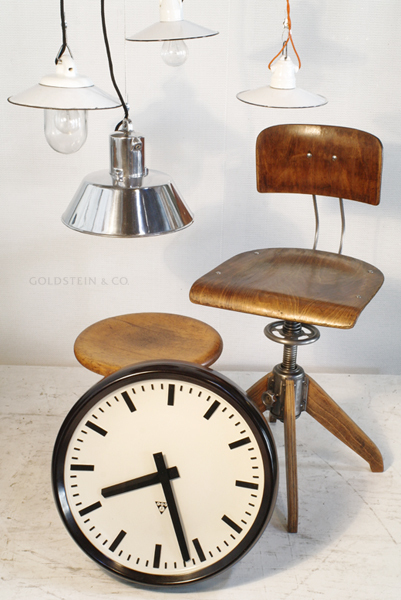 Two pieces are currently available nickel-plated, but we have many more in their original condition in stock. 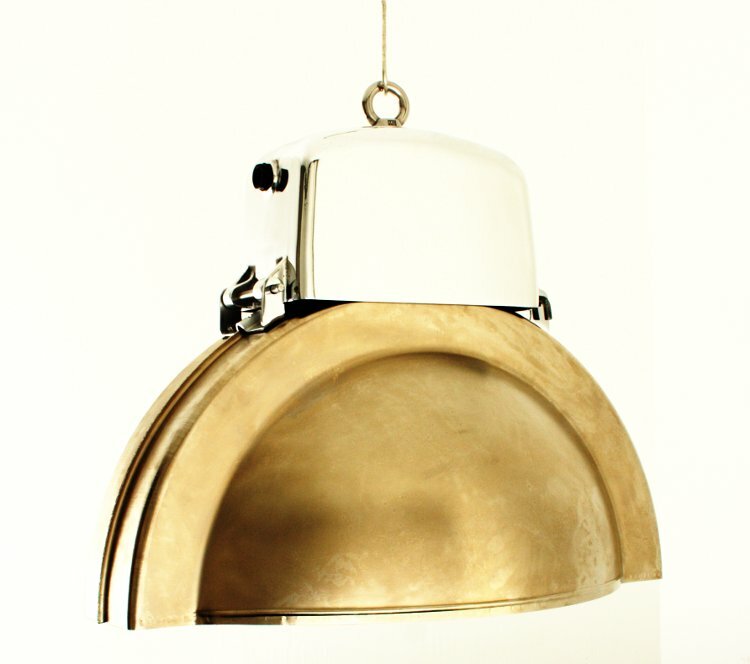 These charming lights feature a top section made out of polished cast aluminium along with a grey enamel shade and an internal reflector fashioned out of polished steel. Their name stems from their extremely unusual shape, which is reminiscent of the helmets worn by Roman centurions. 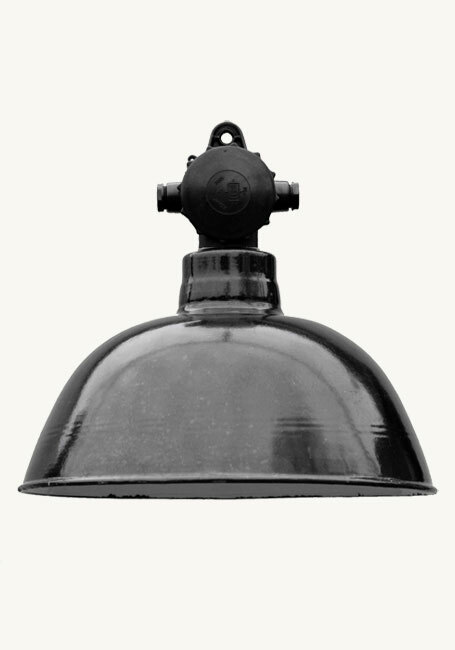 Dating back to the 1950s, only a few of these Roman helmet lights were ever made, which accounts for their rarity value. They were produced by LBL, the successor company to the legendary Kandem (Körting & Mathiesen), which collaborated with the Bauhaus. 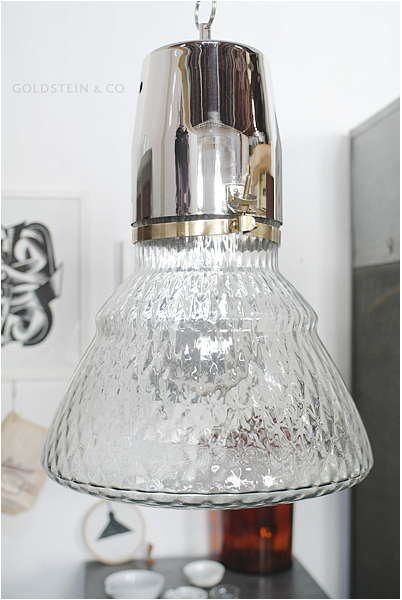 We also have this light in another type in stock with a non-enamelled shade. 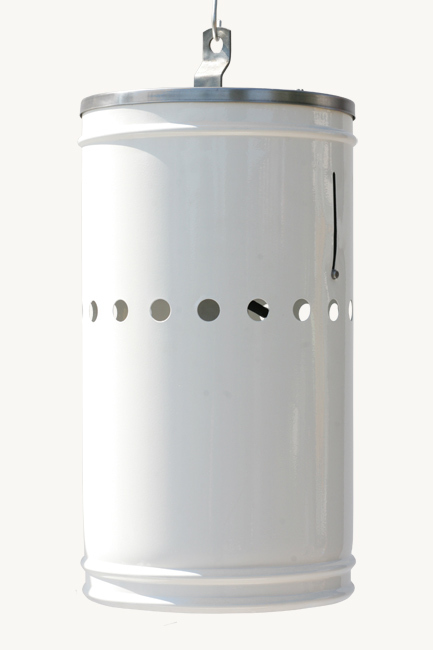 Just tell us what colour you require, and we can have the shade powder-coated in any RAL shade you like. 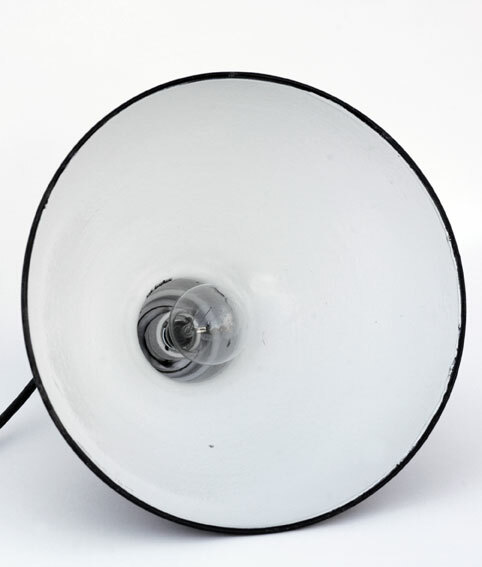 The lights come with their original socket for large E40 light bulbs up to 2,000 watts. 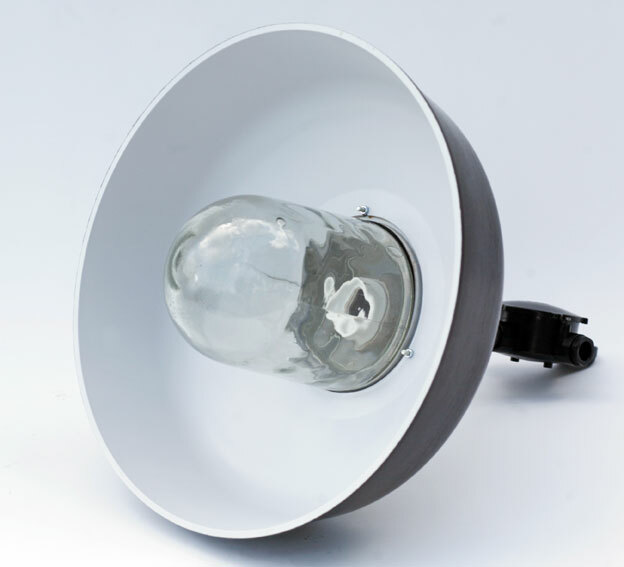 An adapter for smaller E27 domestic bulbs is provided as well. We also sell light bulbs up to 2,000W separately in their original packing. 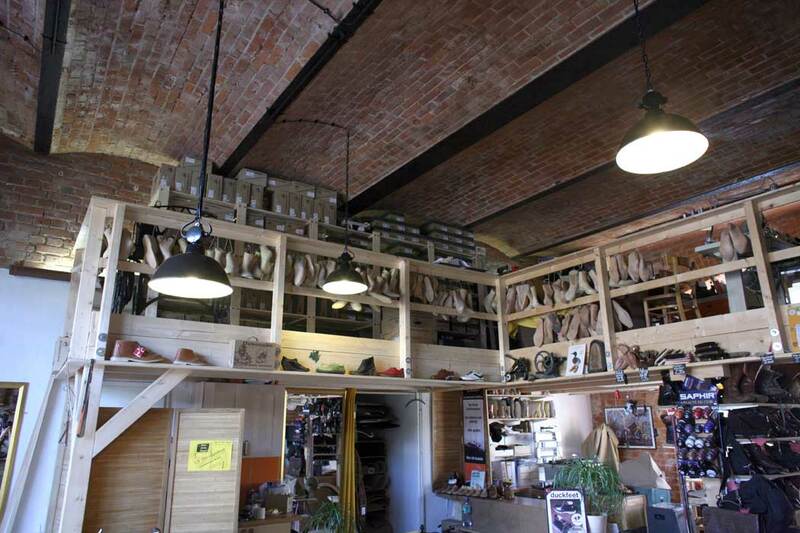 The lights are supplied complete with a 2-metre steel chain and a 2-metre fabric cord in your choice of colour. Very clean communist design! 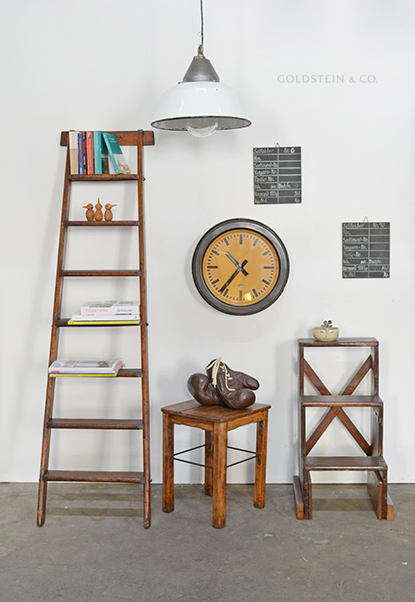 This former high bay spotlight is no trash-can or a side product of a trash-can factory. 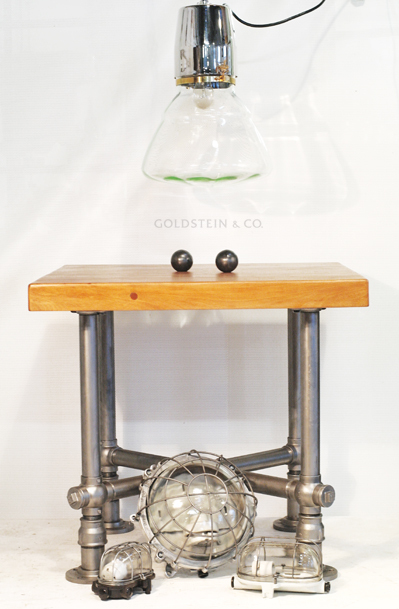 We think this extraordinary item is suitable for bars or kitchens. The body has been cream-powder coated. Other RAL colours are possible. 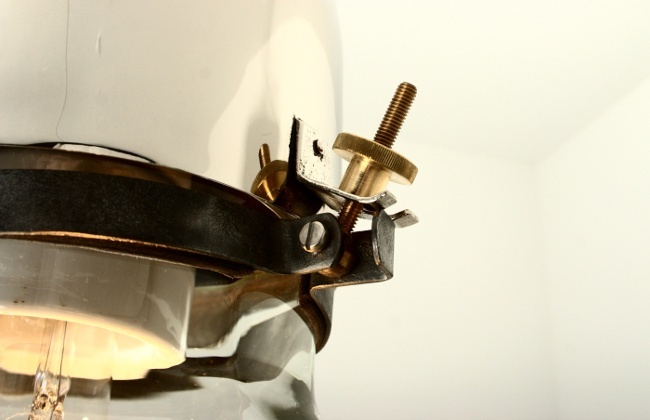 Although the original ceramic socket is compatible with E40 light bulbs, an adapter for E27 bulbs is available, too. What an amazing size! 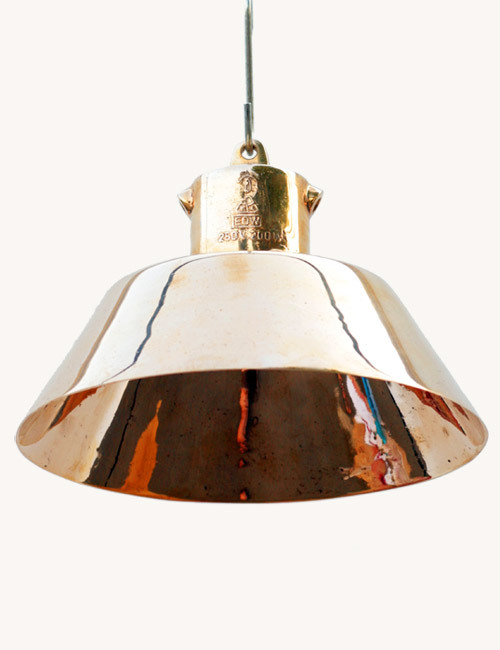 We have salvaged a large quantity of these big pendants. Great condition. 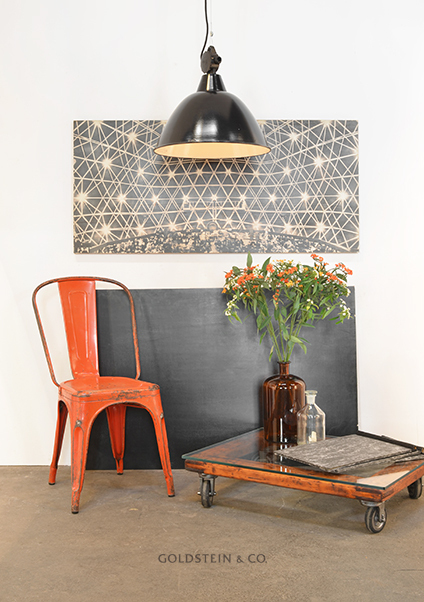 They feature an enamelled shade which is black on the outside and white inside. Fitted with a socket for E40 bulbs (E27 adaptor available). 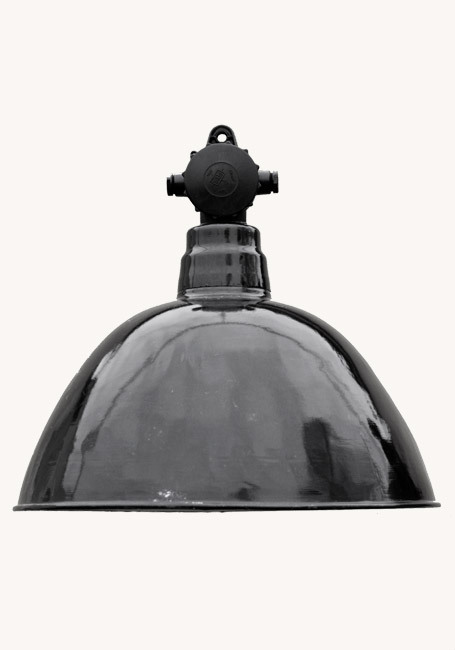 Professional cleaned and steel dome re-polished. 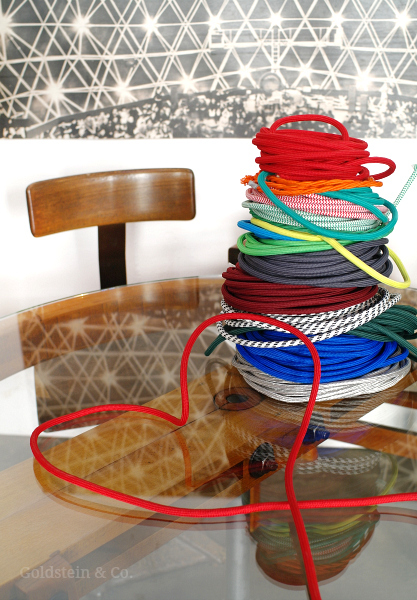 Please note: You can order your own cord color and length! Please feel free to contact us. 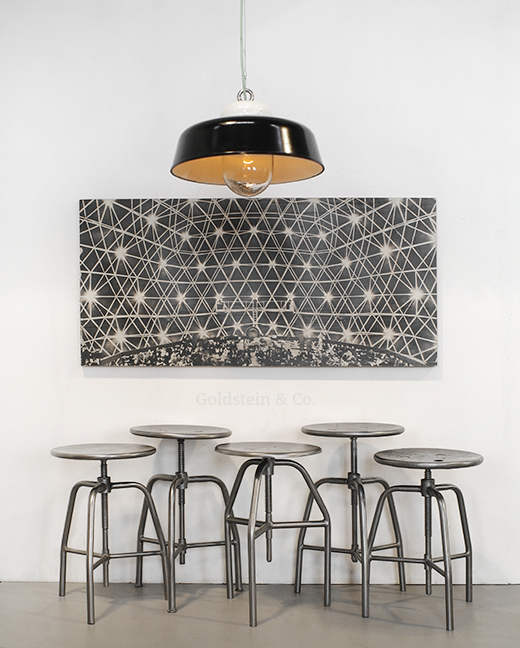 The functional design of these lights was taken straight from the Bauhaus and remained unchanged when it was manufactured for a short time after the foundation of East Germany by VEB Leuchtenbau Leipzig. 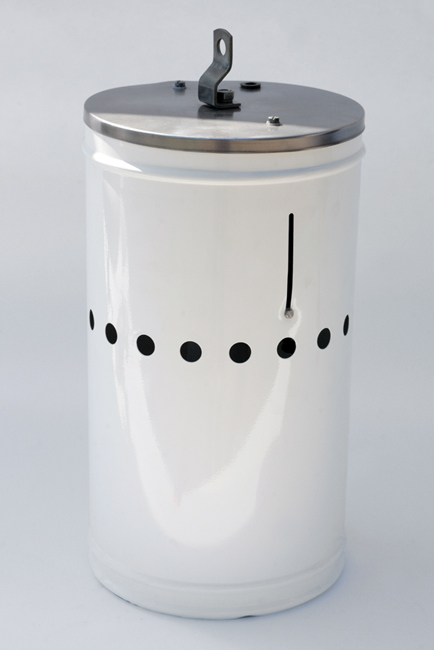 They feature an enamelled shade which is black on the outside and white inside. 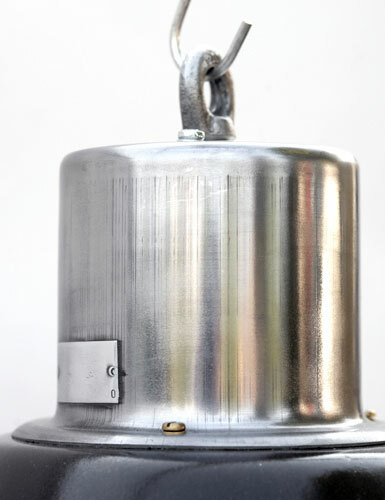 The junction box is made of re-polished aluminium. Fitted with a new porcelain socket for E27 bulbs. 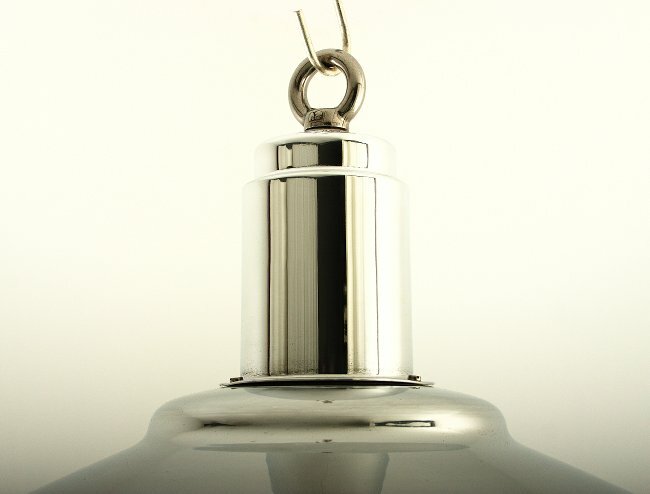 This really is our bestseller since it can be used in so many different settings. Accordingly, we always try to ensure we have large quantities of it in stock. 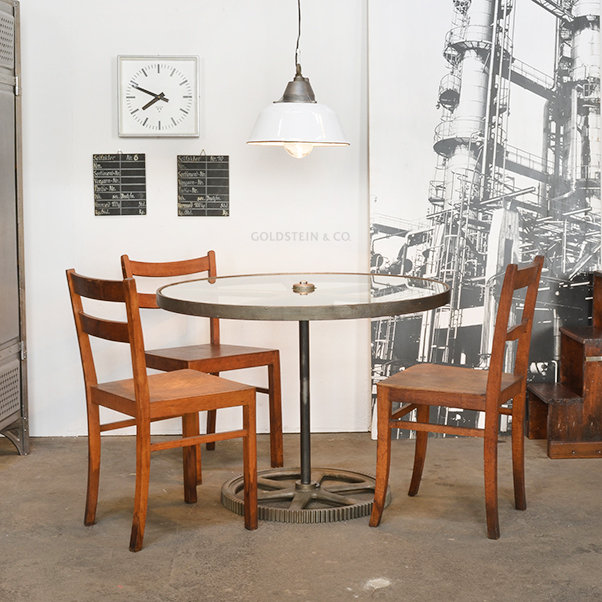 Its design was taken straight from the Bauhaus and remained unchanged when it was manufactured for two decades after the foundation of East Germany by a whole raft of nationalized companies owing to the lack of new machines. 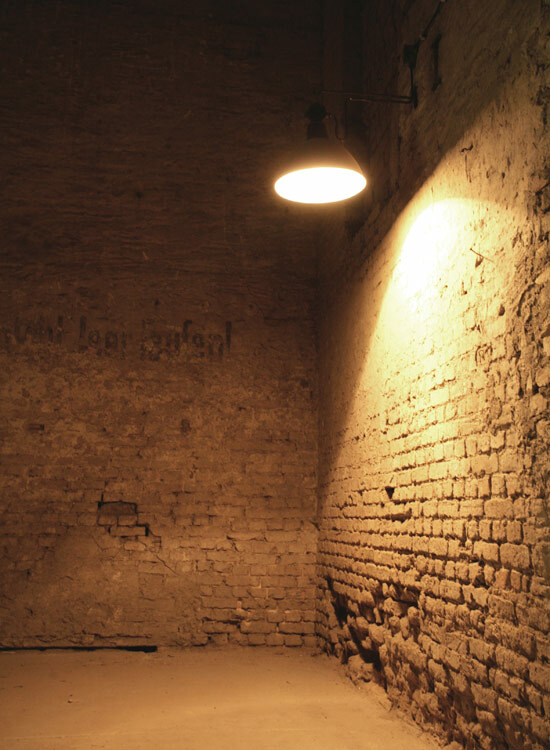 These lights were especially used by the East German railways and on collective farms. 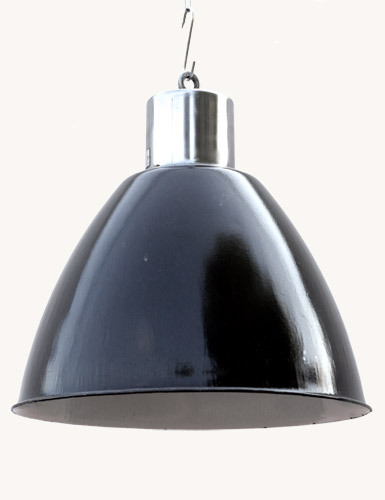 They feature an enamelled shade which is black on the outside and white inside. The junction box is made of Bakelite. 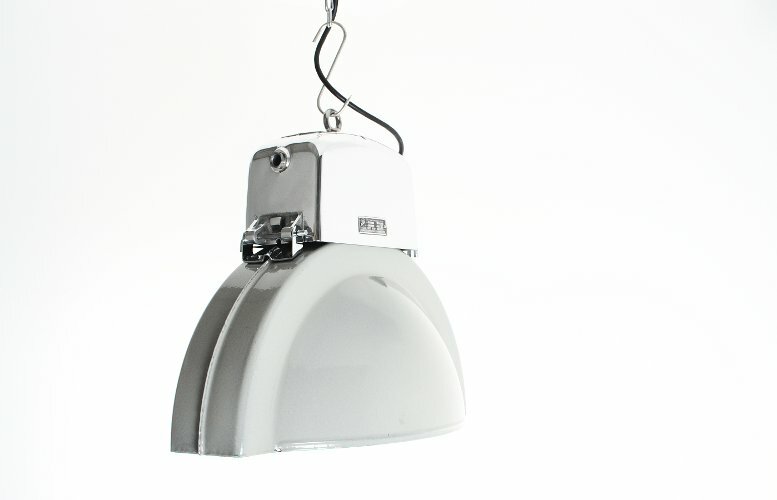 Fitted with a socket for E27 bulbs, these lights are available in three different sizes. 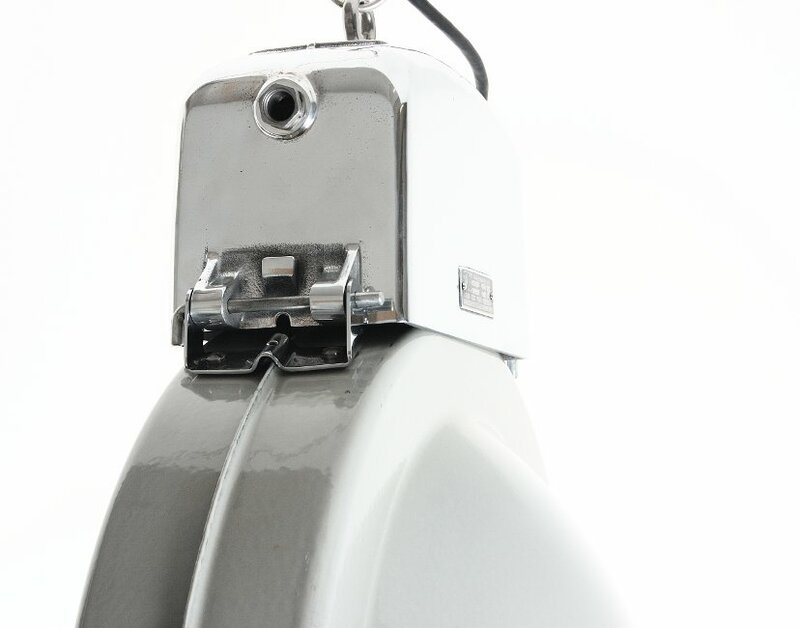 This really is our bestseller since it can be used in so many different settings. Accordingly, we always try to ensure we have large quantities of it in stock. 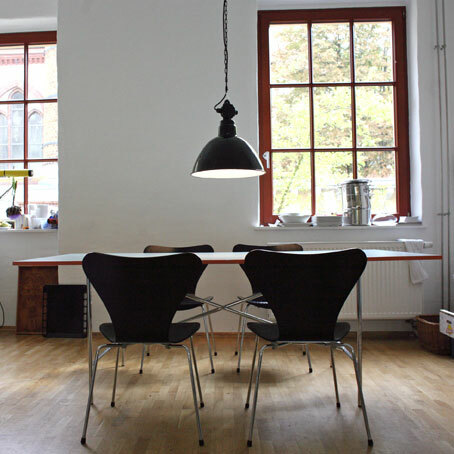 Its design was taken straight from the Bauhaus and remained unchanged when it was manufactured for the last decades of East Germany by a whole raft of nationalized companies owing to the lack of new machines. 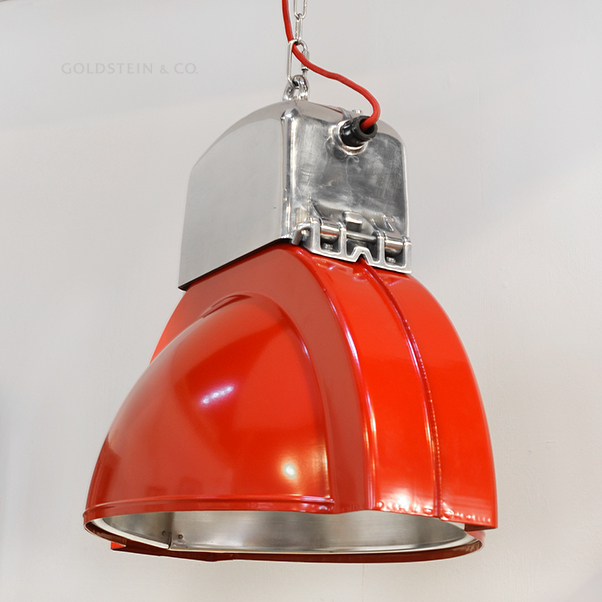 These lights were especially used by the East German railways and on collective farms. 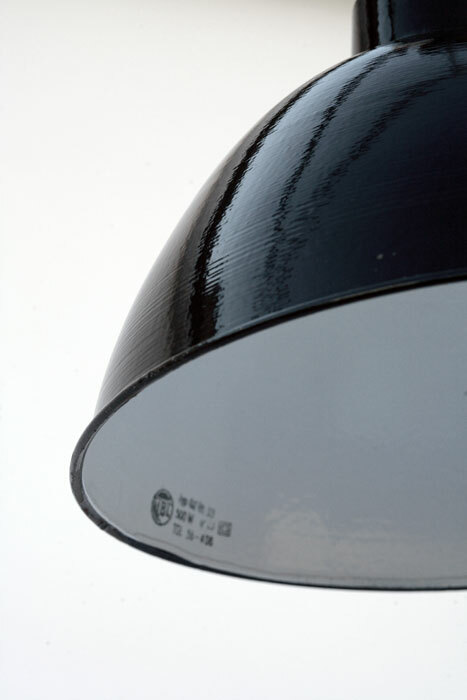 They feature an enamelled shade which is black on the outside and white inside. The junction box is made of Bakelite. 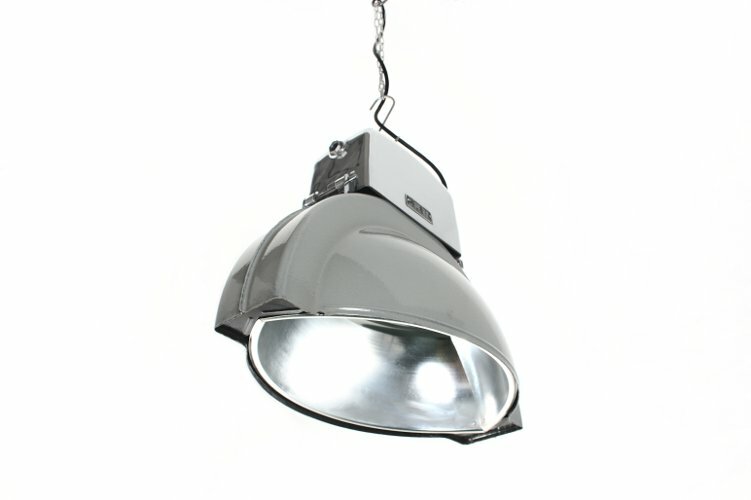 Fitted with a socket for E27 bulbs, these lights are available in three different sizes. 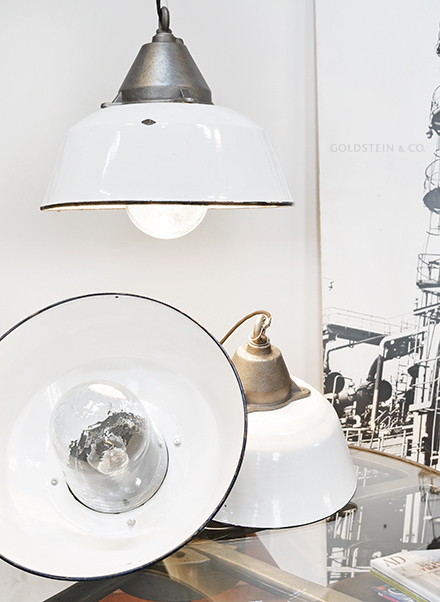 These originally vapour discharge lamps were used relatively frequently to illuminate the interiors of large factory buildings. 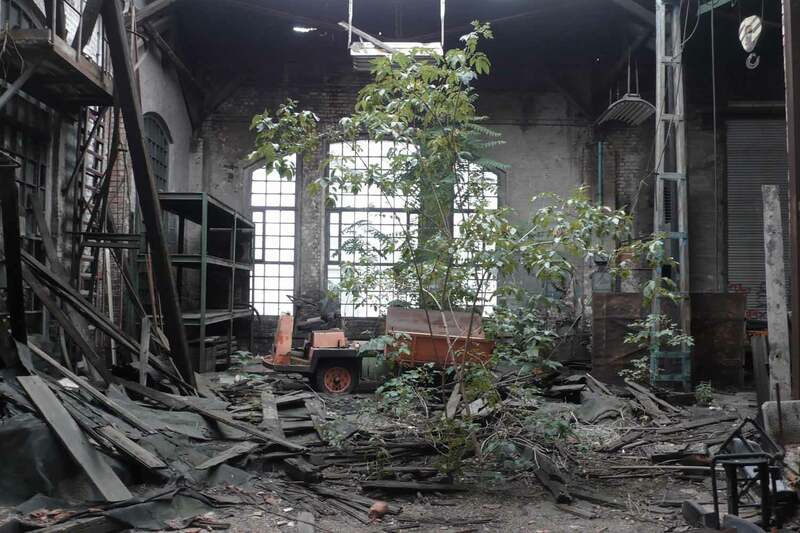 As they were built almost unchanged for nearly 40 years during the Eastern Germany era, we can almost always supply them in large quantities. 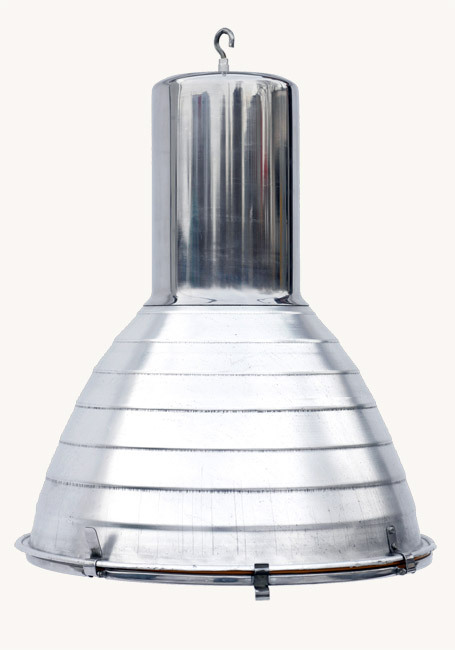 We have retrofitted them to work with regular bulbs, polished the steel upper section and reconditioned the aluminium shade. 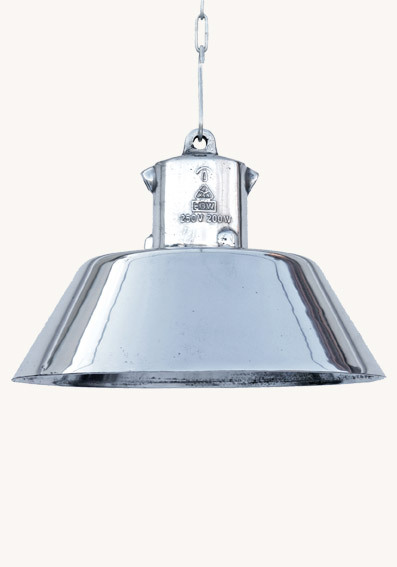 The use of standard bulbs means they can be suspended at a lower height, including above bars and kitchen worktops. 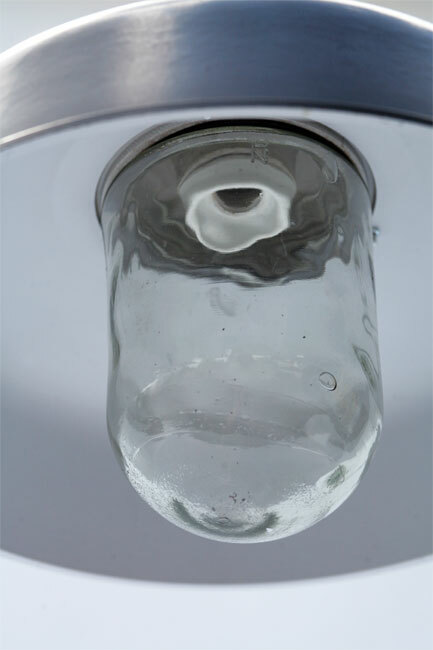 The quick-acting closures allow the glass to be easily folded out. 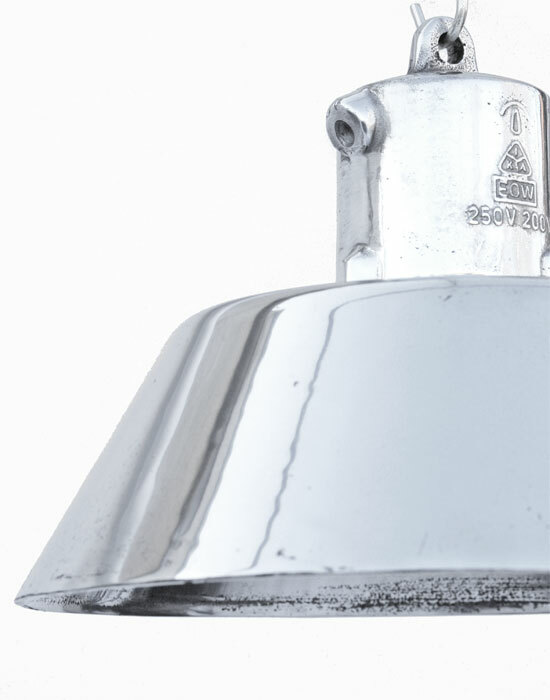 Although the original ceramic socket is compatible with E40 light bulbs, an adapter for E27 bulbs is available, too. 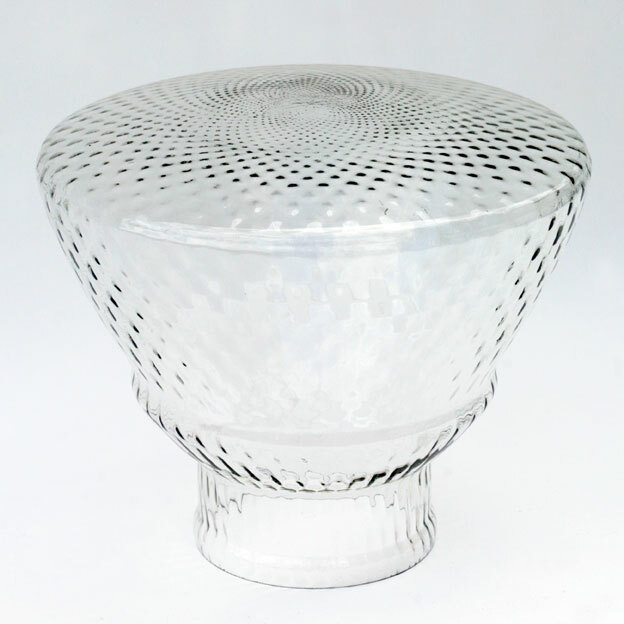 If required, these deep bowl reflectors can also be supplied without the glass. 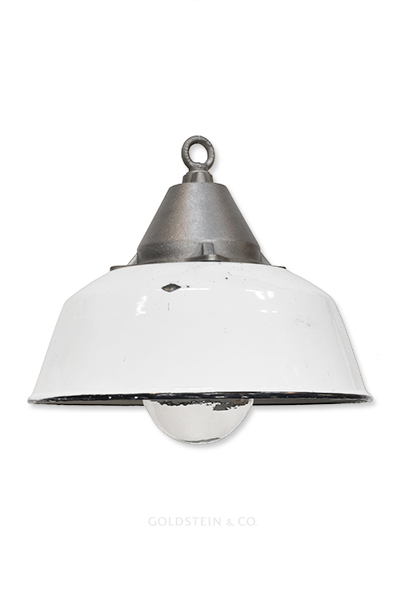 Used as emergency lighting, these lights were suspended from the highest points of factory ceilings, making them very rare and difficult to salvage. 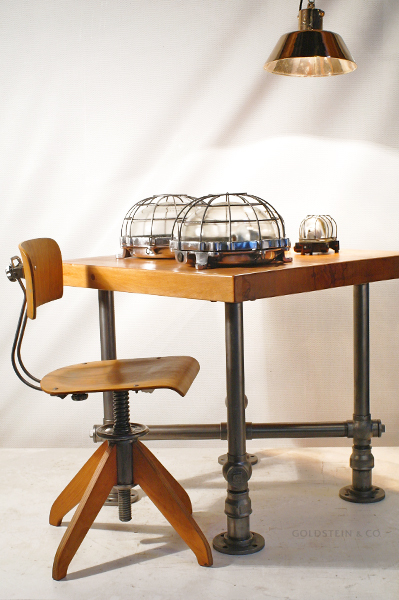 They were built in the 1920s and 1930s to a typically simple design influenced by the Bauhaus. 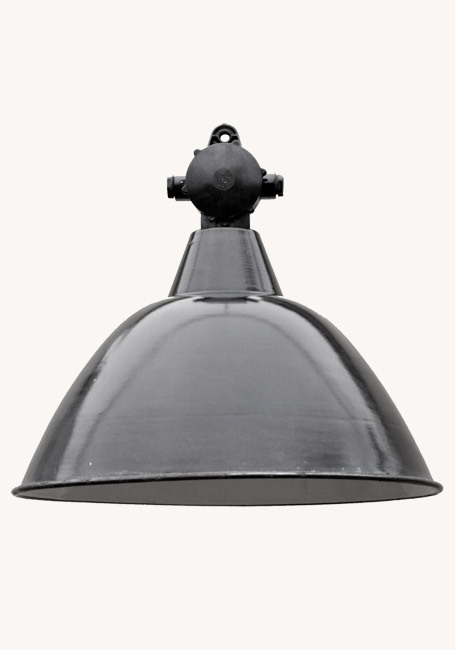 The cast aluminium dome and shade are extremely robust and impact-resistant. 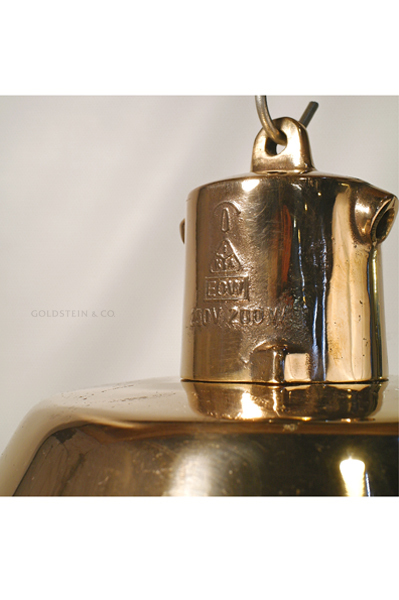 Although re-polished to a high sheen, note that they still contain traces of wear such as scratches and notches. 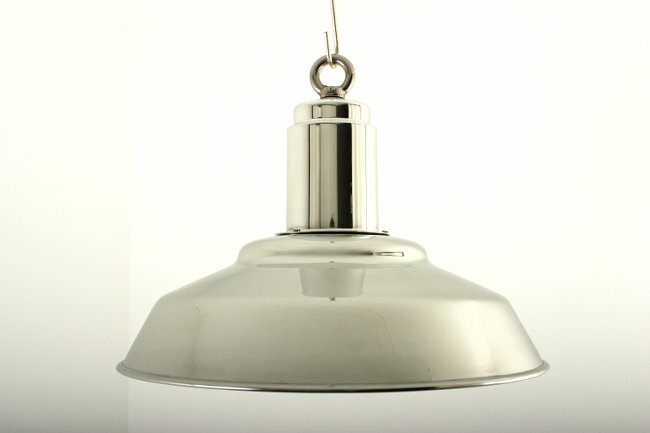 These pendant spotlights come with a ceramic socket for E27 bulbs.